I do like strolling around antique malls and the two large ones I stopped at on my way home from Colorado were a great “Eye Candy” fix. I’ve collected many things over the years and I need to stop accumulating things but I still like to look and check on prices. Toy sewing machines are something I always stop to admire and curb myself from starting a collection of. 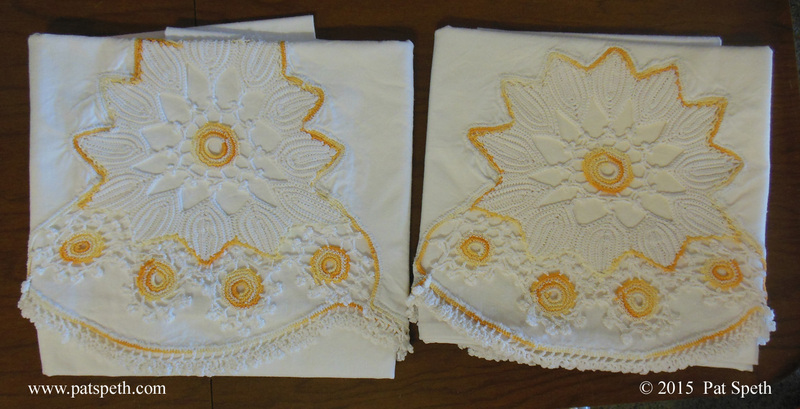 I have about two dozen sets of crochet or embroidered pillow cases so I just took a photo of this set and left them behind. It’s one of the most elaborate pairs I have ever come across. 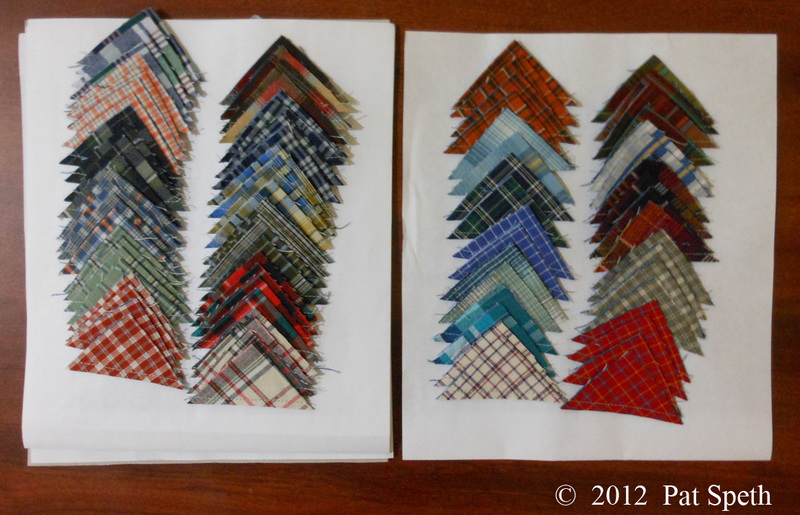 This quilt might be an inspiration for a waste triangle project someday. 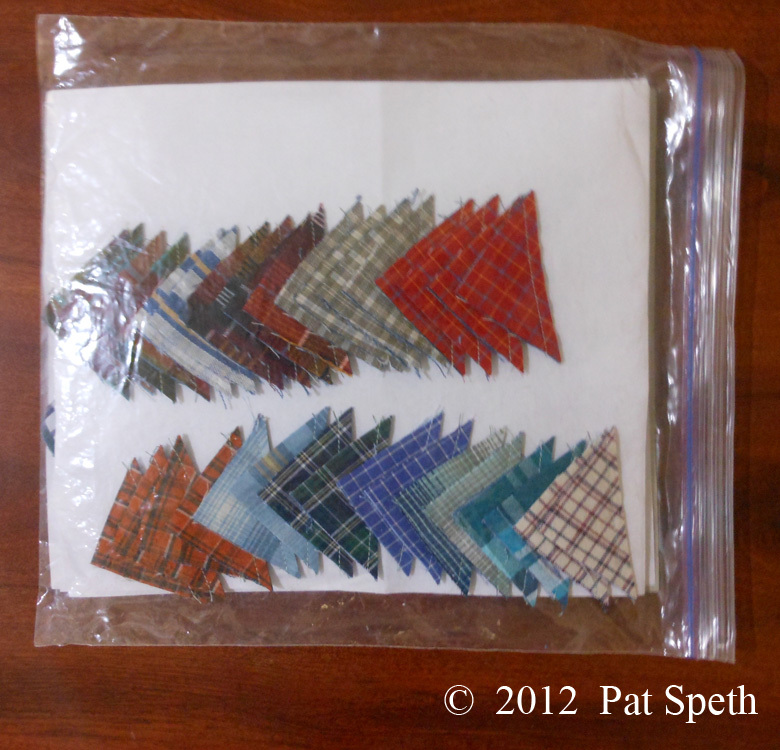 Earlier this year I started some cleaning and organizing in my quilting studio and came across an amazing number of waste triangles I have saved over the years. It’s time to put some more of them to good use. 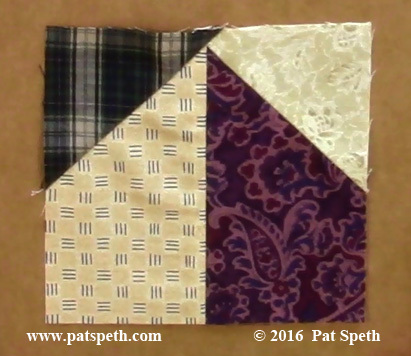 I do have on my website four free waste triangle patterns for all to use. 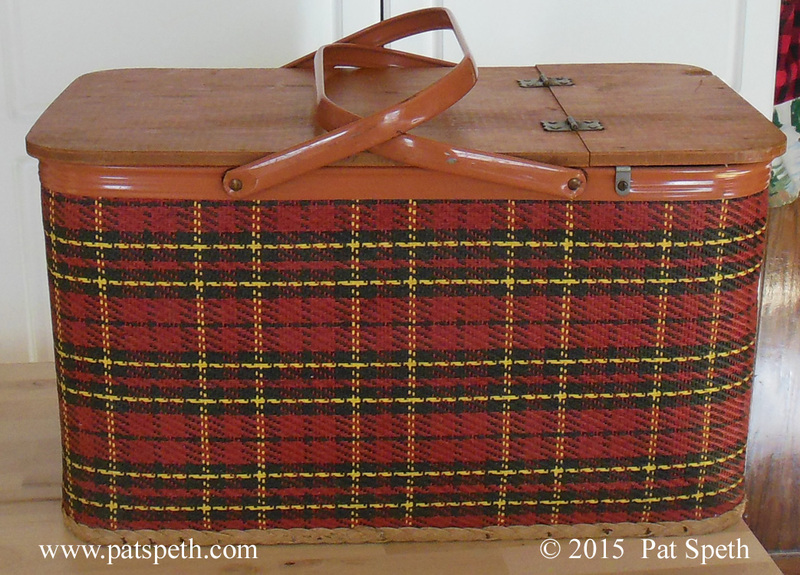 My purchase of the day, this great plaid picnic basket! I’ve already used it when I took some rhubarb crisp, straight from the oven, over to my daughter’s and her husband’s studio, for a late morning treat. Many more road trips and antique malls coming up in my schedule! 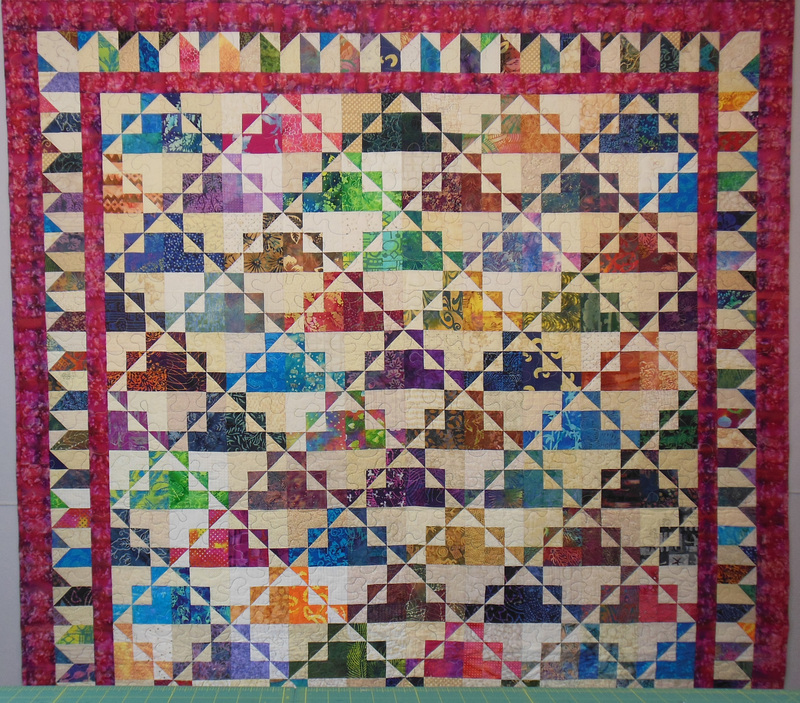 The next workshop for the Southwest Florida Quilters Guild was Small Wonders in which eight different quilts could be worked on. 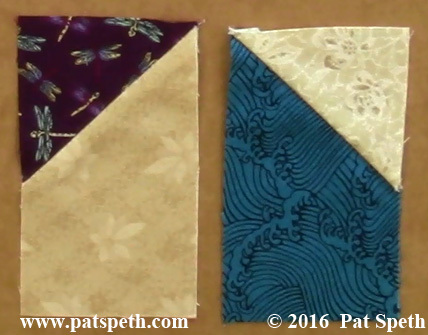 These are blocks for the Prairie Gems quilt in the Amazing Nickel Quilts book, already being auditioned with the sashing and cornerstones. 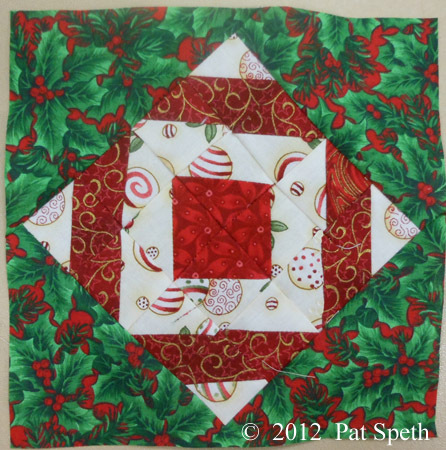 What a great way to use those christmas prints! 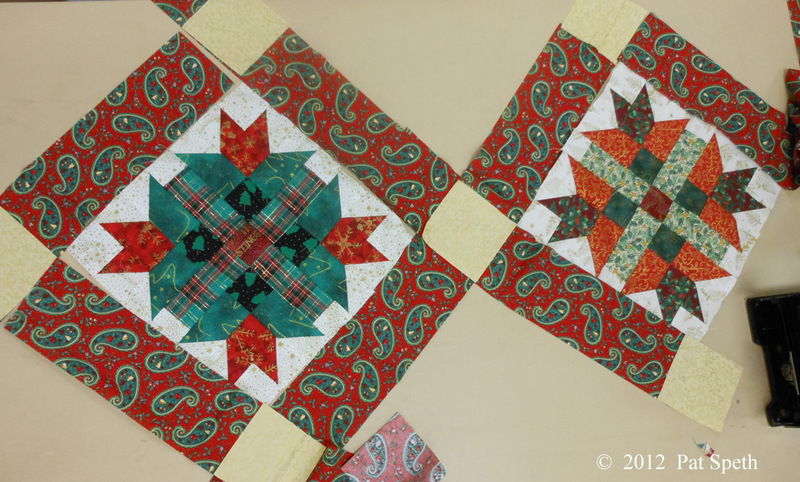 A block for the South Dakota Star quilt, which is an individual pattern. 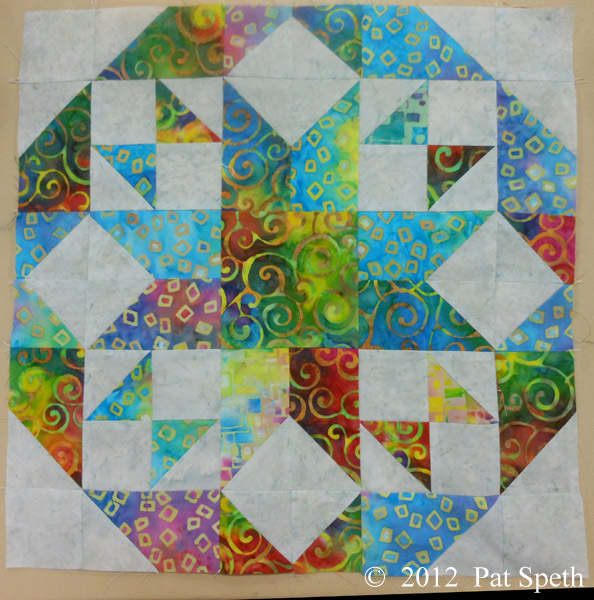 Only three different fabrics are being used in this block but the variation of color within the fabric itself makes the block appear much scrappier than it really is. Someone also brought to class a block constructed from the waste triangles made in the previous day’s workshop. I think I will start referring to these triangles as Waste Not Triangles! So far I have about twelve of these Churn Dash blocks done and I’m gearing up to do more. My quilting was put on hold for a while during preparations for my daughter Roxie’s wedding, and I’m anxious to get some serious quilting time in soon. Each block needs 4 waste triangles. While traveling, I like to use my down time on the computer designing or writing more patterns. But there are times after teaching all day that I don’t want to do any more serious thinking! So for this last trip I planed ahead and brought along some waste triangles to trim. Everything I need to trim fits nicely in this plastic portfolio. As I was working on the wedding quilt and creating these waste triangles I just started laying them out on sheets of paper and kept stacking the sheets. Several layers slide nicely into a gallon size zip lock bag. The rest of my supplies fit in also and I’m ready to go! 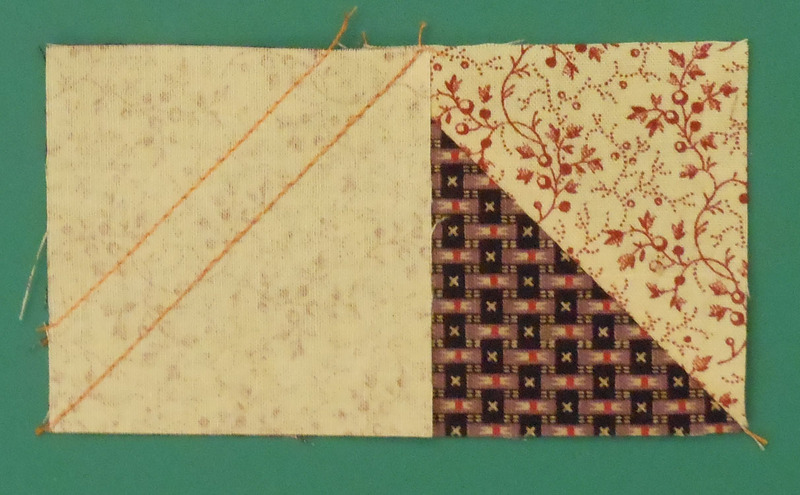 I will use these churn dash blocks as my leaders and enders while I sew on another quilt. It takes a little organizing ahead of time to do this but the results are so worth it! 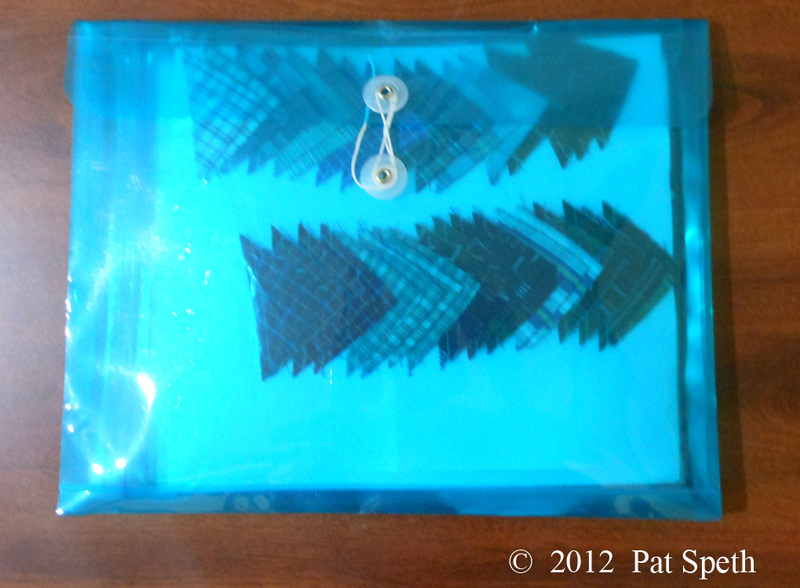 Two 5″ squares – one dark and one light. 1. On the wrong side of a light 5″ square mark the 2 1/2″ point on each side of the square. 2. Draw lines to connect the marks. 3. 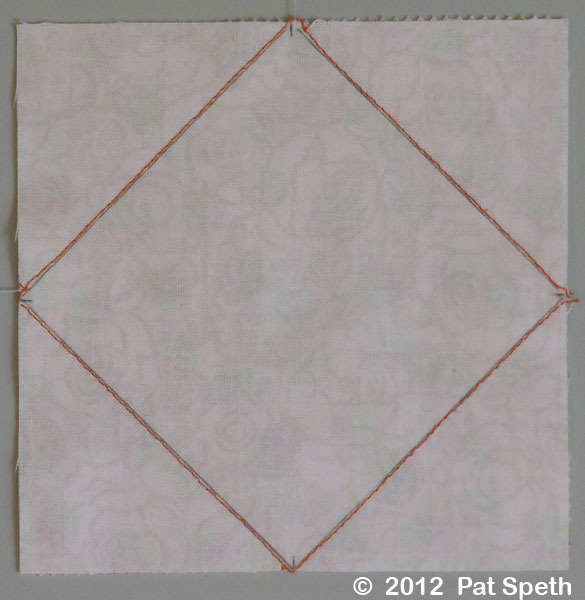 Place the light square right-sides together with a dark 5″ square. Stitch along side the drawn line but not right on it – about one thread width to the outside of the drawn diagonal lines (towards the corners). 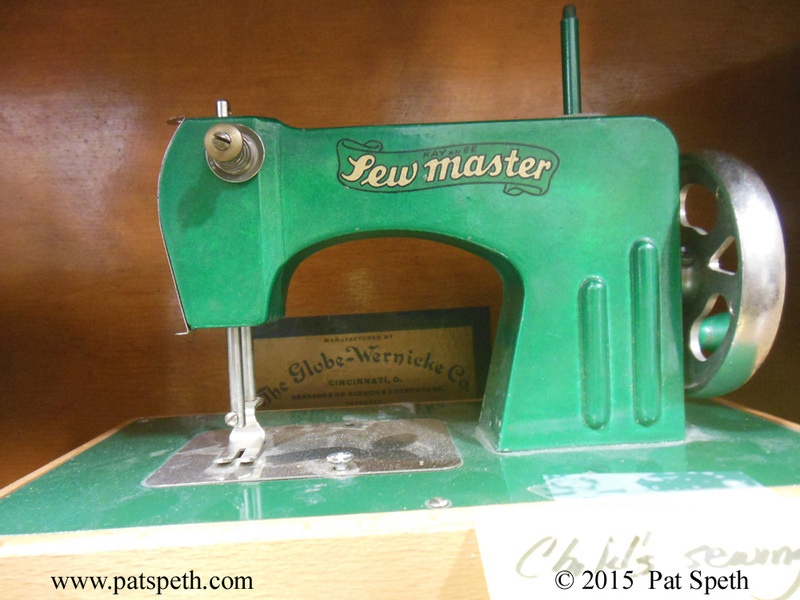 This is to allow for the thickness of the thread in the seam allowance and the pressing of the fabric over the seam. 4. Cut the unit in half lengthwise and crosswise at the 2 1/2″ marks. Each resulting unit will measure 2 1/2″ square. 5. Test the alignment of the triangle edges with the square. If desired, you may stitch a second seam 1/2″ away from the first seam to sew your waste triangles together before cutting them away. 6. Done! 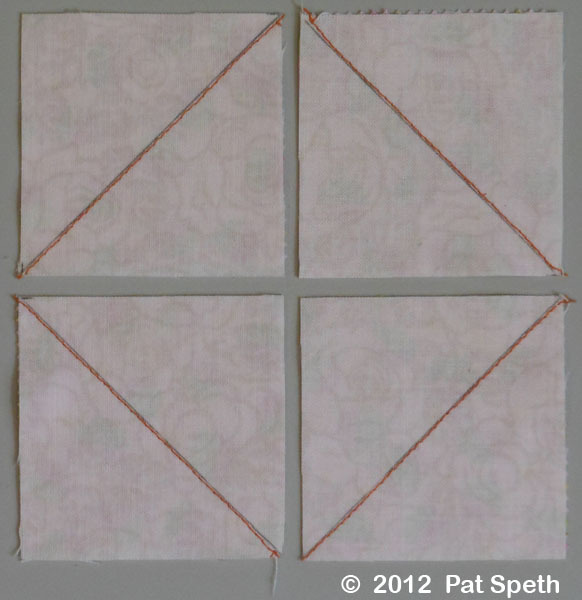 Four half square triangle units that should measure 2 1/2″ unfinished and will finish at 2″. 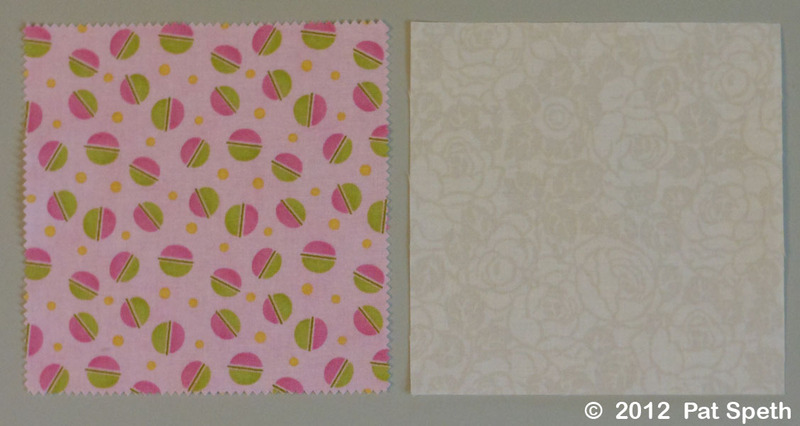 Stay tuned for an upcoming blog post with a quilt block that will use these little guys! Starting on some test blocks for the perpetual calendar of 366 quilt blocks which use 5″ squares that I’m writing, I’ve realized it would be fun to share these blocks with you! 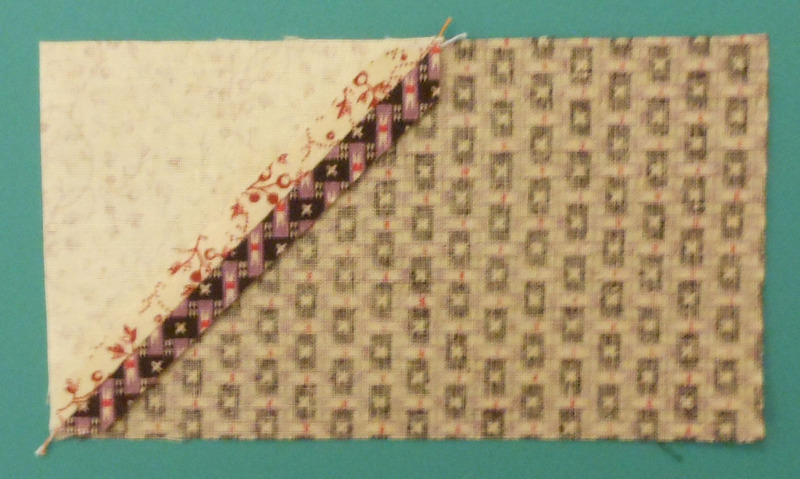 By the time I’m done with some of this testing I will have enough blocks for a sampler quilt – so join in this with me and make your own Nickel Quilt sampler! I also thought that having one blog post devoted to a basic unit would be a good idea, that way when a unit is repeated in another block I won’t have to enter all that basic information again, I’ll just refer you back to that day. 1. 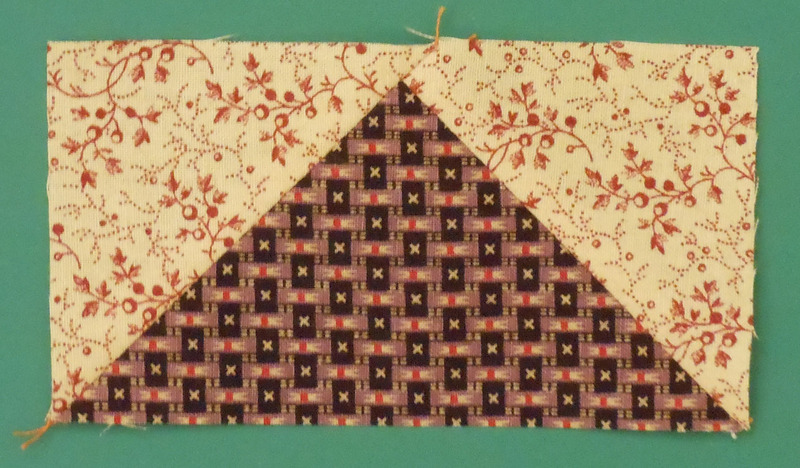 Select 5″ squares for the large triangles in the flying-geese units and trim 1/2″ from one edge. 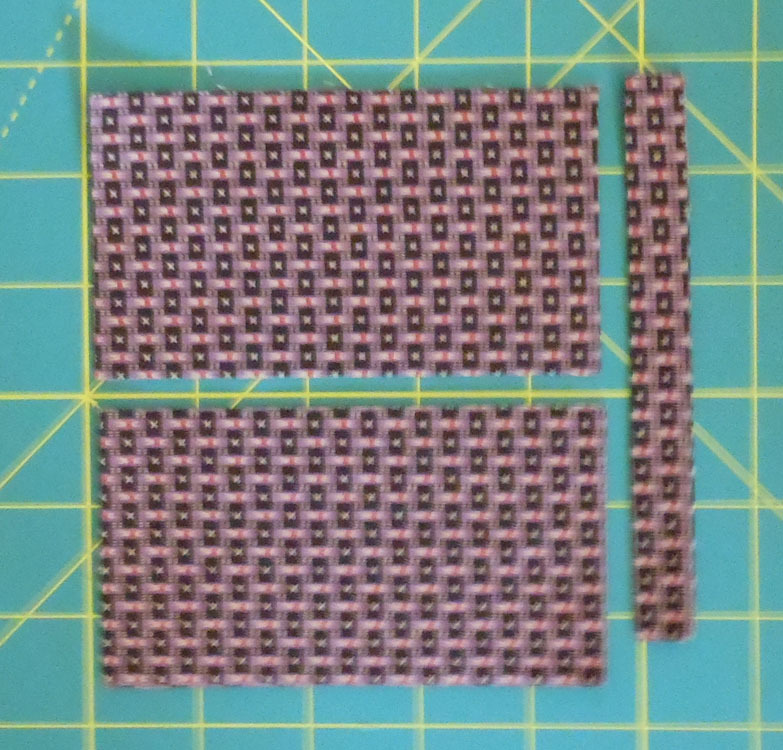 In the opposite direction, cut the trimmed piece in half so that the two resulting pieces each measure 2 1/2″ x 4 1/2″. 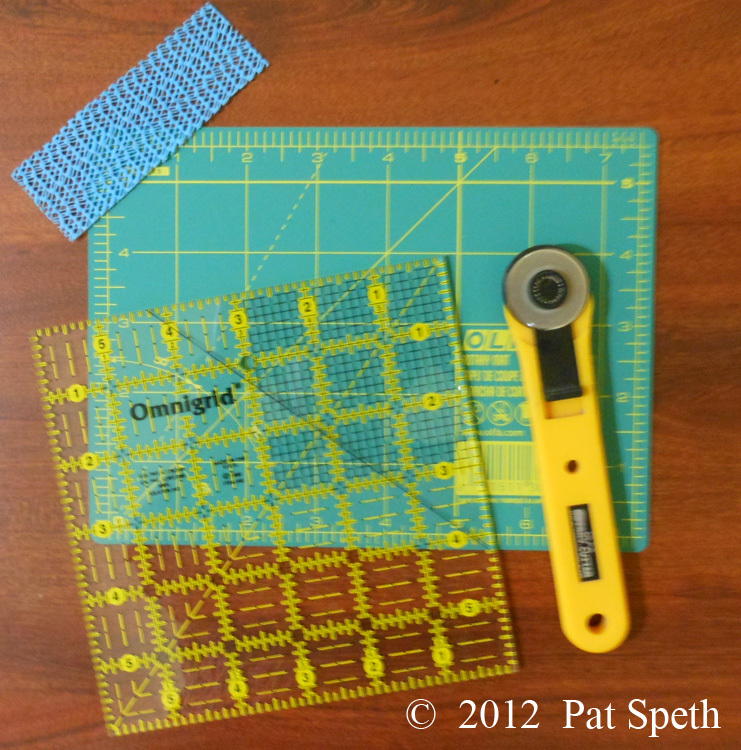 You could also cut these rectangles from 2 1/2″ strips. 2. 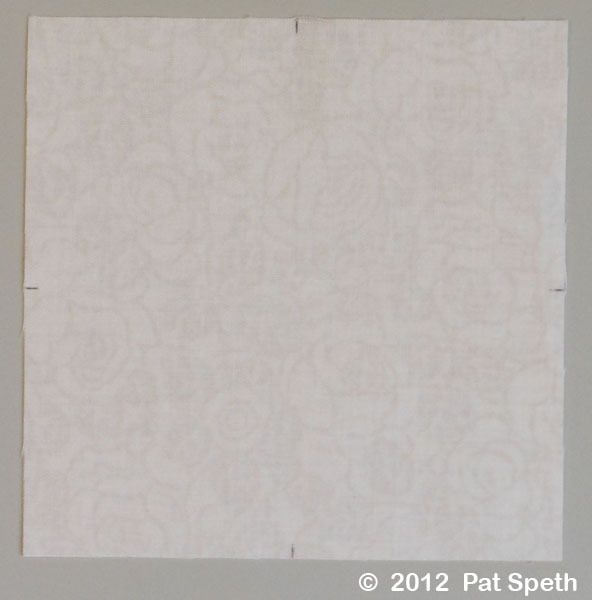 Cut a light 5″ square into four 2 1/2″ squares. 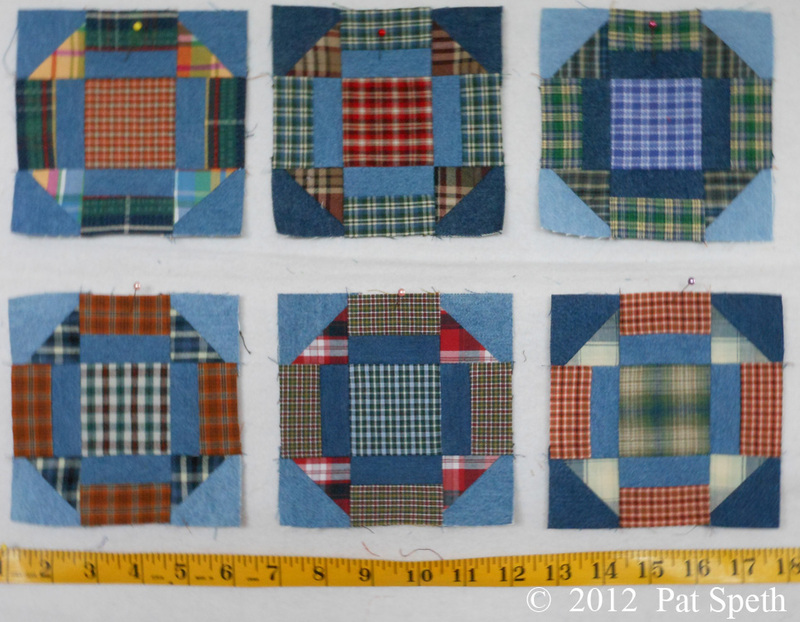 Yes – these squares could also be cut from 2 1/2″ strips. 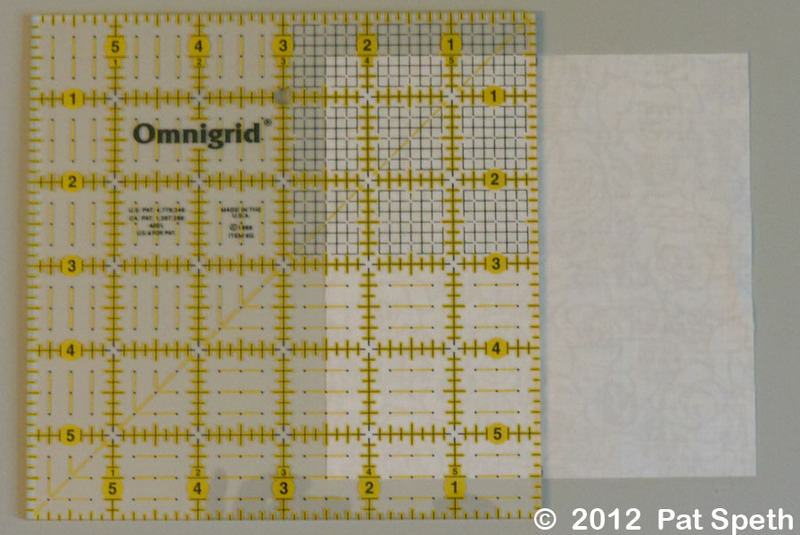 Draw diagonal lines on the wrong sides of the 2 1/2″ squares. 3. 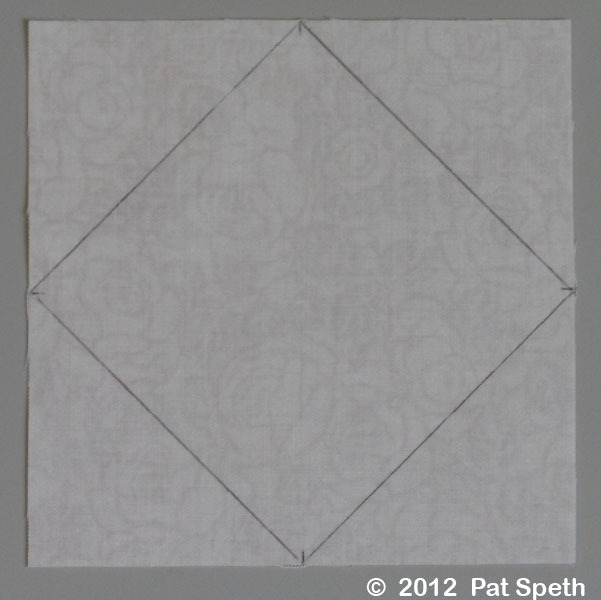 With right sides together, place the marked square on top of a 2 1/2″ x 4 1/2″ rectangle at the right-hand edge. 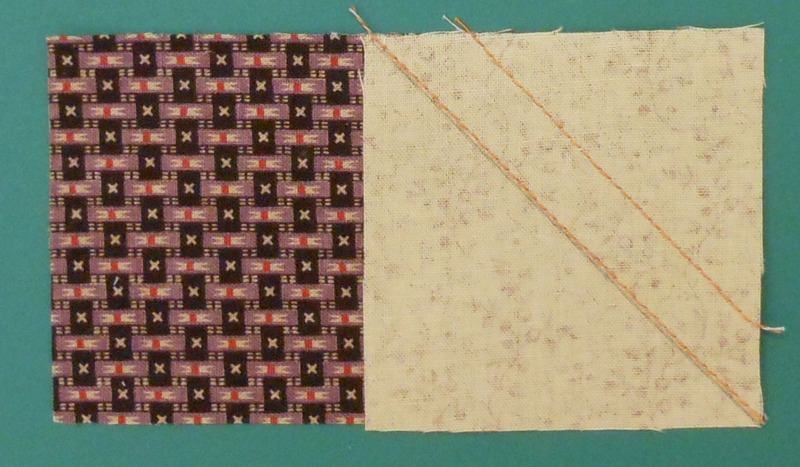 Stitch one thread width to the outside of the diagonal line (towards the corner you are going to cut away). 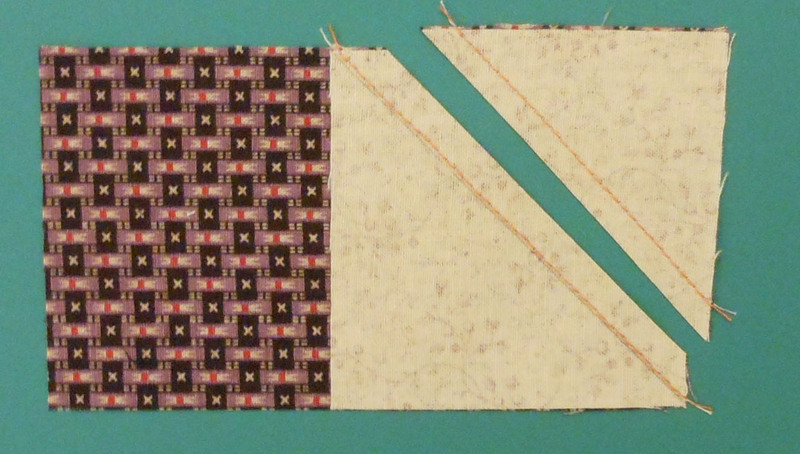 If you would like to make use of the waste triangles this is a good time to sew another seam about 1/2″ away from the first seam (toward the corner you are going to cut away). 4. 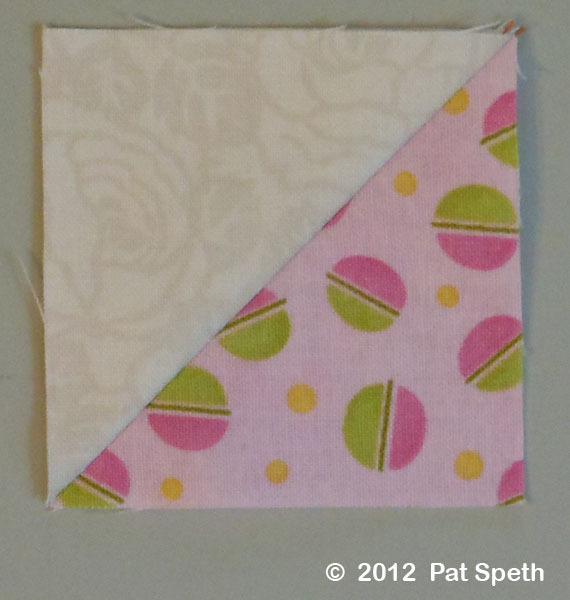 Fold back the seam toward the small triangle and check the alignment of the triangle with the edge of the rectangle. 5. After the alignment has been checked, trim away the waste triangle and press the seam open. 6. 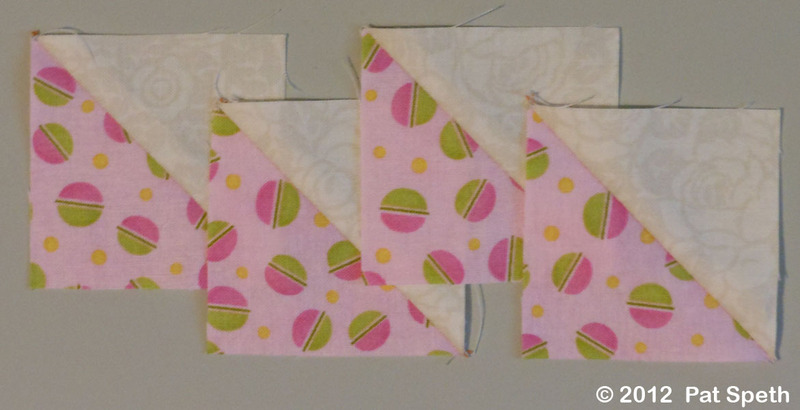 Repeat steps 3 through 5 to add a square to the left-hand edge of each rectangle. Each flying-geese unit should measure 2 1/2″ x 4 1/2″ unfinished. 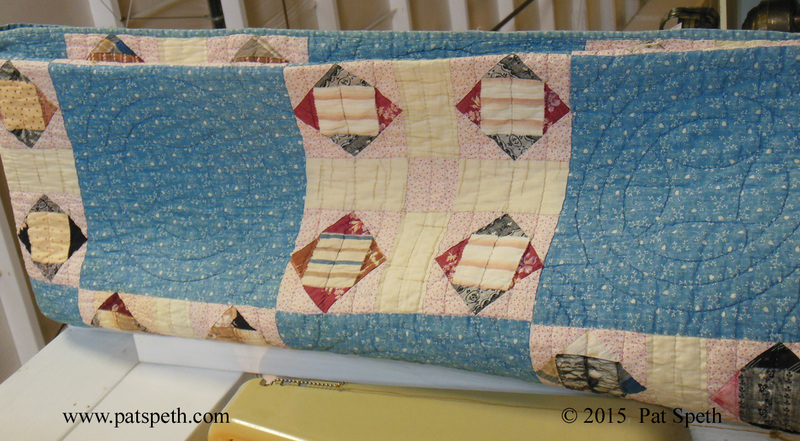 What we are looking for on this unit are nice points in the lower corners and a 1/4″ seam allowance at the top edge which will give us another nice point when this unit is sewn to something else. 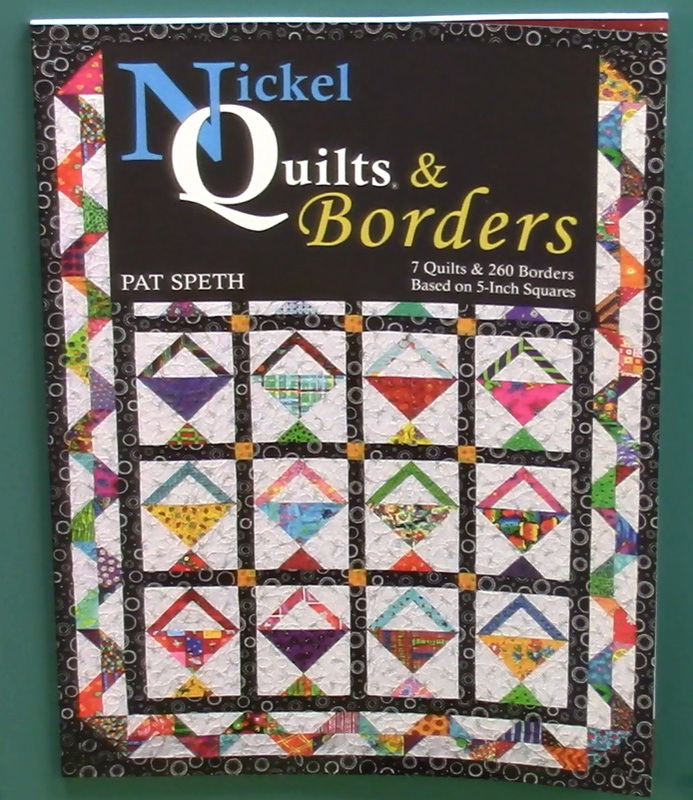 For years I made these units and pressed the seam towards the smaller triangles, but when I started on the Nickel Quilts & Borders book I made the switch to pressing those seams open and those are the instructions I have given you here. We will be using these in a block soon!